Decorating with Onyx. 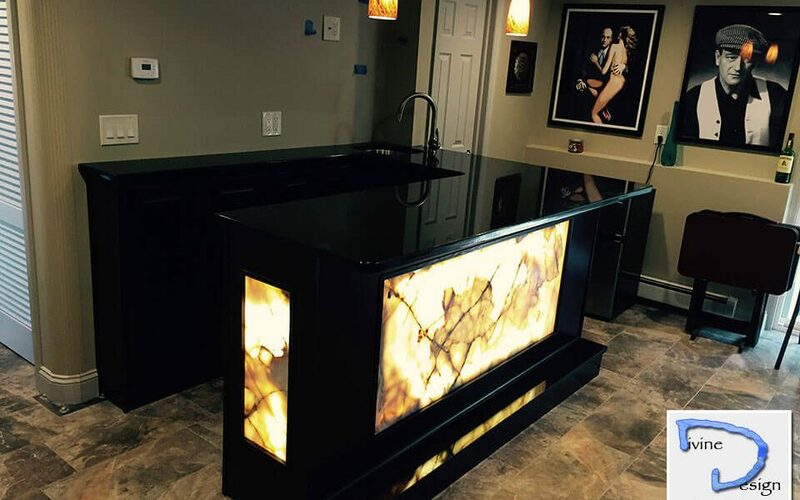 One of the excellent materials offered by Divine Design is Onyx. Onyx is a mineral of volcanic origin considered a semiprecious stone, a natural stone unique in the world for its color tones. The vast majority of its applications are in interior design and decoration due to its shades and high polishing quality. One of the main characteristics of onyx is that it is a translucent material, which because of this quality changes color depending on your lighting. Because of this it lends itself well to backlighting and is one of the most suitable gemstones for decorating interiors. 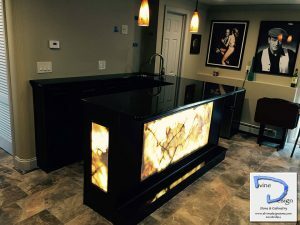 Onyx Countertops have a great visual appeal and due to its variety of color tones has a vast range of applications, from decorating elements to the lining of different spaces of the homes. Onyx is fragile and soft and therefore great care is required. One of the peculiarities of this stone is that it’s delicate and easily stained or marked so particular care must be taken when cleaning or handling this material. It is advised not to use sharp objects such as knives directly on Onyx, and that it be kept free of dust and chemicals that may stain it. Onyx has a wide variety of applications. It is the perfect material for projects in where you want to accentuate a particular area or just stand out from the crowd. In addition to its characteristics, Onyx will draw your attention with its elegance, be it part of a bar, a section of wall or a decorative figure. The features of onyx are unique in the market, so it is usually used for decorating surfaces that need great aesthetic care such as meeting areas, hotel surfaces, boutiques or exclusive restaurants. Because of its decorative beauty, this stone is capable of giving a unique touch and striking elegance to any space. However, the material needs constant and precise care to maintain its good condition.